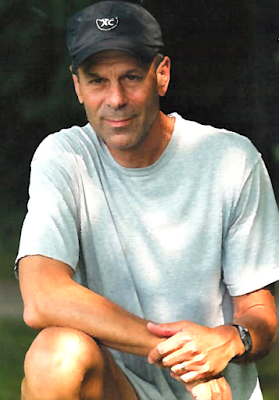 (3-19) Marc Bloom has enjoyed incredibly long, productive careers in running and running journalism, beginning in 1964 and extending to the present. His next book, Amazing Racers, is due to be published in early August. It's about the amazing success of the Fayetteville-Manlius high-school cross-country program in upstate New York, and how coach Bill Aris has inspired so many runners. Bloom's personal running is just as impressive. An undistinguished performer three decades ago, he now ranks among the nation's best for his age. When did you start running and why? It was spring 1972. I hadn’t run since HS grad in ’64 and had gained weight. I didn’t feel “right.” I’d been married three years at that point. My wife (Andrea) and I lived in Brooklyn and would go to a nearby HS track to play paddleball. I started jogging a few laps, one thing led to another, and I started doing some mileage on the roads, and by fall ’72 was running 40 to 50 miles a week and had lost my extra weight, about 20 lbs. My first race was a 3M on a frigid Thanksgiving morning, on Staten Island. every year from 1973 into early ‘80s, I ran 50 or so mpw, with a high of 60ish, and a highest week ever of 80 (once). I ran every day. In retrospect this was a mistake because I was not really suited to the marathon—body or mind—and would have been better off and more content with shorter stuff. Best or proudest running achievements? Around 40, I ran a 5:02 road mile and 5:06 on the track, which wasn’t too bad. In my mid-30s I ran a 1:25 half marathon. (I could never put together a good marathon—3:17 PR, in the first NYC 5-boro, in ’76.) Around 40, I broke 30:00 for 5M a number of times, mid-29s (and also ran 17:45 5k PR and 37:10 10k PR around 40). I’ve probably never been totally satisfied with any one race, I’m hard on myself, for better or worse. I’m now 72 and have run some good races—track, road, cross-country—through my 60s to the present. 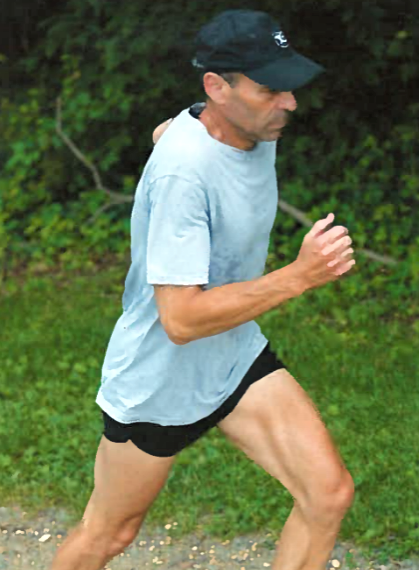 5:40 mile at 60ish, 19:50s 5ks around 65, 70-min 10M at 64, a few national masters age-group medals in track and XC. Most proud might be, in my late 60s, I ran an 11:45 3k on the track and, about 20 minutes later, a 2:55 800—winning my heat. Also I'm proud of the hard training I can still do—and welcome—into my 70s. I like to run “fast” and do so every chance I get. That’s what makes me feel “the best” about my running. I’m a volunteer coach in HS and as recently as my mid-60s I could stick with some of the top girls on the team in various workouts like 2M time trial, 5 x 1000, hilly distance runs…. 14 x 400 w/60 sec recovery. You've been writing almost as long as you've been running, right? Yes. My initial interests in track and field, running and writing intersected in the early 1960s when, as a so-so quarter-miler on the high school track team (Sheepshead Bay of Brooklyn), and pretty poor cross-country runner, I started sending results and stories about the area's top performers to Track & Field News. At 18, I started writing by-lined high school track and X-C stories for the Long Island Press, and at 19 I started covering events for The New York Times. This early experience with newspapers, urged on by wonderful role models, formed the emotional heart of my journalistic value system and gave me the grounding to be ready whenever opportunities presented themselves. I went on write hundreds of NY Times stories for the sports pages and other sections, become editor of The Runner magazine for its nine-year run, write for Runner's World and Running Times for a combined 25 years-plus, write on health and fitness for scores of other publications. Also, I published "Harrier" High School X-C magazine, creating the national team rankings, for about 25 years, and this led to events like Nike Cross Nationals, which I helped start. My book writing seems to have come full circle, starting in the mid-'70s with a title called, Cross Country Running. With the new book, Amazing Racers, I've returned to cross-country. Total lifetime miles? I’ll round it off to 80,000. Current running and cross-training now? Strength work? Stretching? My program has been the same for more than 20 years. I run 4 days a week, swim twice, bike once (road bike in good weather, spin bike in winter), plus do a weight/core session (about an hour) twice a week. Run mileage averages about 30 per week. Bike ride outdoors is usually 90 min-2 hrs. Swim (includes run in the pool), an hour each time. I stretch after every run, about 15-20 min. On workout days, I jog 15 to 20 min warmup, then stretch and do stride-outs; after the workout, I repeat the stretching and strides (usually 100m). A recent race or two? Last fall at 71+ I ran two 5ks in 22:20, a 10k in 47 min, and won the NJ state masters 8k XC 70-74. 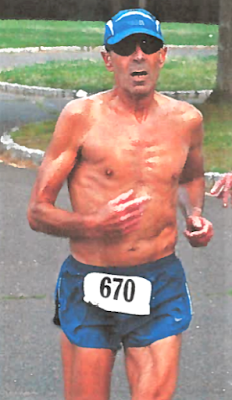 In 2017, after turning 70, I placed 4th in the national masters 70-74 8k and 10k, and 4th at Fifth Ave Mile in 70-74, in a national-level field. Last weekend I had a satisfying 5-mile race in 35:57 with some minor hills and bracing winter wind. Does it bother you that you are slower now? How do you deal with this? How do you maintain motivation against the inevitable aging process? Who or what inspires you? I have no problems at all getting slower. I was never a great runner so I don’t have a high level to compare to. I never frame my running as “getting slower”. I always look forward to the next hard work-out, and whatever race is coming up. I do well in my age group but try and compete against the entire field in a race, like make the top 10%, which I often do. HS kids inspire me—those that I coach, and others. Some of the pros too. Their style of running is so beautiful, I feel I want to emulate them, even if I can’t. I am firmly connected to my physiological age (probably around 30), not to anything else. Injured or injury is not in my vocabulary and has no place whatsoever in my thought process or consciousness. I have not been to a single doctor or other health practitioner for muscular-skeletal pain since 1994. Any discomfort that might come about, I use Sarno’s methods, and in 25 years they have been successful 100% of the time. If I happen to have some pain, I use my mind to get rid of it, at times within minutes. I keep Sarno’s most complete work, “The Divided Mind,” as a close reference. He did save me and change my life. He gets all the credit for my fulfillment as a runner in the later years. He died a few years ago in his 90s. His importance to the thousands he treated cannot be over-stated. Three tips for other hopeful lifetime runners? 3--The power of the mind is central to the entire experience. How does running and fitness improve your life? I cannot be separated from my running/fit self. My identity, my heart and soul, who I am, how I live, all of it circulates within my running and fitness endeavors. Running is… life itself. Biggest life and running lessons? Love is the answer to just about everything. Think of others. Shrink your ego as much as you can. Ego directs almost everything you do; that’s why you get into “trouble.” The mind is paramount, a la Sarno. Realize that “The Divided Mind” means that you will always be the child and adult in conflict, and need to find peace in satisfying both.